This isn’t just any ol’ food truck! This is a full pizza kitchen on wheels! You have to see it to believe it. 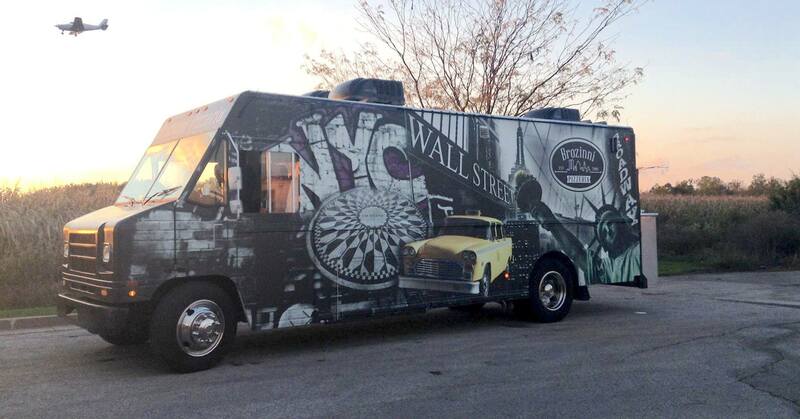 Our over-sized pizza truck was custom made with a full stainless steel pizza oven and kitchen. We can cater a full company party, conference or event – just contact us! Thanks to the team at SlyFox Creative for the beautiful wrap! Brozinni Pizzera is a family-friendly pizza place. Get a taste of New York right here in Indianapolis, featuring the Big Apple's signature crust, our famous buttery garlic knuckles and a great menu of Italian eats. © 2016 Brozinni Pizzeria. Headquartered at 8810 S Emerson Ave Indianapolis, IN 46237. Call Us at (317) 865-0911.